Over the last several years, traditional “outbound” marketing practices have become totally ineffective. Your prospects are no longer responsive to overt sales tactics and “interruption marketing” – that is, marketing that interrupts their day with unsolicited and unwanted ads, direct mail, or telemarketing. Instead, your prospects know they can find everything they need to know on the internet. They’re doing extensive, self-guided research looking for content to help them make purchasing decisions. And in that process, the blog has established itself as a critical tool for “inbound” marketing activities and a hub for all the educational content and insightful articles that attract technology buyers (and the search engines, like Google, for that matter). Simply put, your blog can be a key source of influence over people involved in the technology buying process. 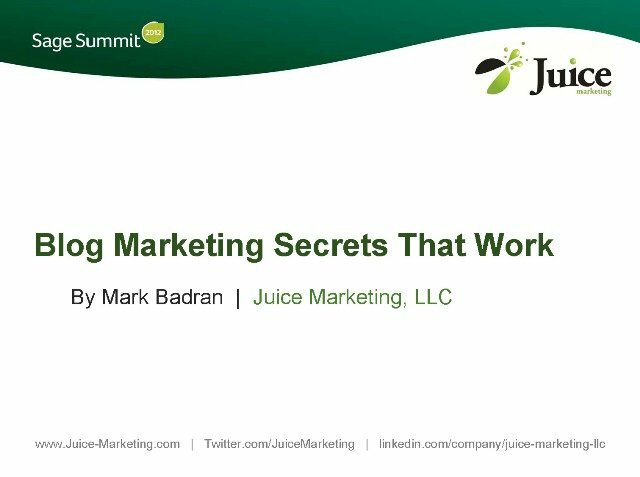 Download Blog Marketing Secrets That Work in PDF format.